Chimpanzees may be humans’ closest genetic link, but this scientific fact has not protected these apes from falling to abuse and harm at the hands of humans. Premiering Sun., June 15 at 7 p.m. ET/4 p.m. PT on Animal Planet with a special hour-long episode, Escape to Chimp Eden follows the rescue and rehabilitation efforts of the Jane Goodall Institute’s Chimpanzee Eden. Set in the heart of the Mpumalanga region of South Africa, Chimp Eden is a sanctuary where rescued chimps can recover from the horrors of human captivity. With harsh circumstances ranging from neglect and malnutrition to physical injury and even drug and alcohol abuse, these needy chimps find community and safety with Eugene Cussons, Chimp Eden’s Rescue Director. With only roughly 150,000 chimps remaining in the wild, these atrocities cause a serious decline in the chimpanzee population while insulting the integrity of these dignified apes. Cussons, a native South Afrian, puts himself in harms way to rescue these chimps from abuse and ultimately protect them from extinction. 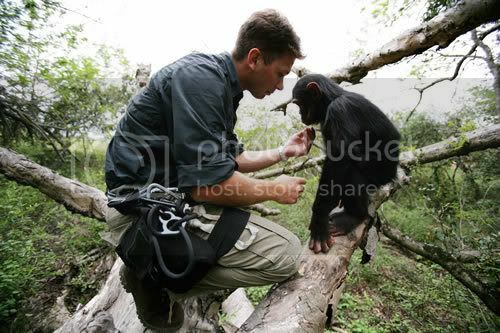 He researches the locations of the endangered animals and negotiates their release to Chimp Eden where they can be rehabilitated and be given a new chance at life. From teaching an abused chimp to climb a tree for the first time to the emotional moment when the rescued chimp takes its first steps toward becoming truly wild, each of the 13 half-hour episodes of Escape to Chimp Eden are filled with strength, friendship and most of all, hope.